Sorry for going dark these past couple of weeks. My guy and I have been crazy busy moving homes and, just to keep life really interesting, we topped everything off with another epic road trip across Canada. Now that things have settled down a bit, I thought I’d kick off my return to blogging with some fun–a quick report on garden sculptures that may leave some with a case of the heeby jeebies. As quirky garden trends go, giant bug sculptures are certainly attention-grabbing. I suppose if you have a fear of insects, this wouldn’t be in a good way. A creepy crawly bug sculpture surprises passersby outside the Fernie, B.C. city hall. Shot in May, 2017. These ant sculptures are part of a sculpture garden outside Fernie City Hall in British Columbia. Shot May, 2017. But you’ve got to admit that there’s something funny about most of these big metal bugs. (Funny as in ha-ha, not funny as in weird. Except the praying mantis shown below. It’s just weird). When portrayed so much larger than life scampering about rocks and across window ledges, they take on a cartoonish quality. And you have to be a gardener with a sense of humour to pass on the tasteful woman-holding-urn sculpture in favour of big metal beetles or mosquitoes. 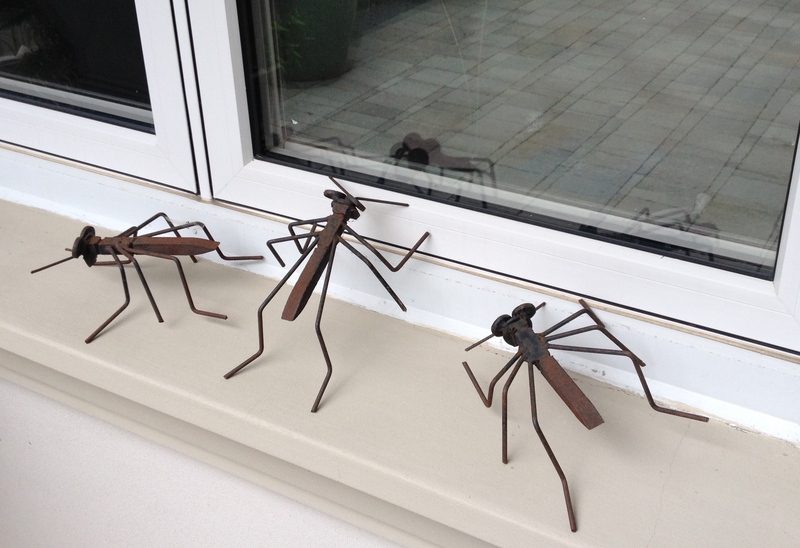 Whether ants or mosquitoes, these small metal sculptures, placed on an outside window ledge at a home in metro Toronto, are a wink to nature’s less popular denizens. Accenting a garden with big metal creepy crawlies may not be to everyone’s liking but I’m sure we can all agree that most live bugs in our gardens should be welcomed. Beneficial insects do so much to keep destructive insects at bay and they do it naturally. No pesticides needed. Take spiders. They’re a prime predator in the garden, gobbling up all kinds of destructive insects like aphids. 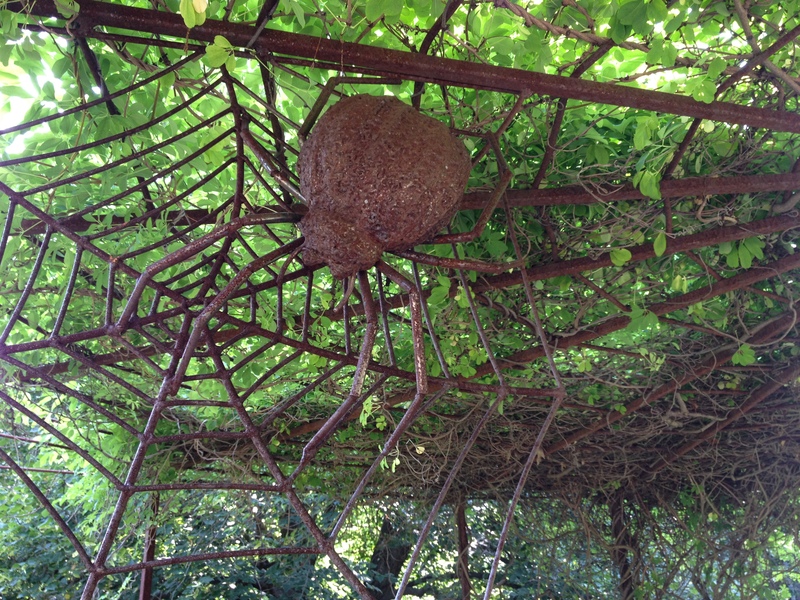 This rusty metal spider lurks within a webby pergola-like structure in the Royal Botanical Gardens near Hamilton, Ontario. So why not celebrate our insect friends? The garden sculpture in the photo immediately below is a great example of the Go-Big-Or-Go-Home style of garden decor. When I encountered this sculpture in a private garden north of Toronto, part of a TBG gardens tour, my jaw dropped. I reckoned this baby stood about 20 feet high. It certainly made a statement, particularly when the sunshine blindingly flared from its stainless steel curves. But, hey, even praying mantis are helpful to the gardener. They eat moths, among other things. And we’d been told the gardeners of this distinctive garden had a special personal attachment to the praying mantis. To each their own. 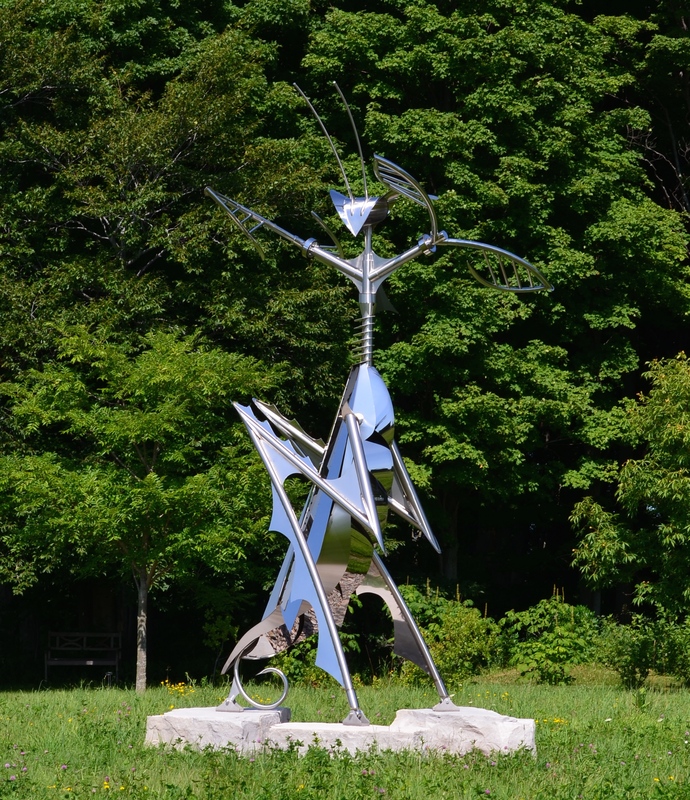 This stainless steel stylized praying mantis is part of a private garden located north of Toronto, Ontario. Personally, if I were to introduce a big metal bug into my garden, I’d probably go for something sparkly and pretty like this shimmering butterfly I discovered in a private garden during a tour hosted by the Niagara-On-The-Lake Horticultural Society. Butterflies may get everyone’s attention for their gorgeous wings but they’ve got a lot more going on than just their looks. As prolific pollinators, they’re also a hard working beneficial insect for the garden. 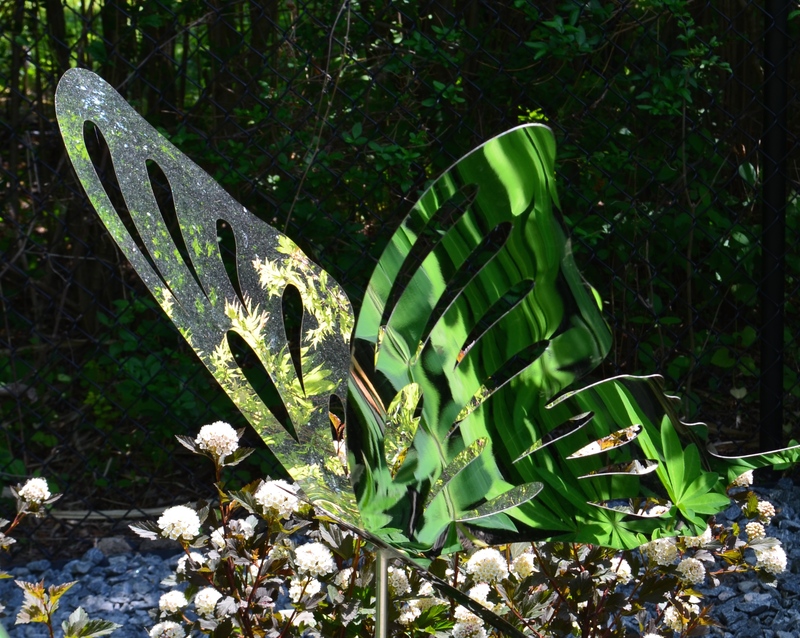 The reflective quality of this stainless steel butterfly, displayed in a private garden near Niagara-on-the-Lake, Ontario, makes the sculpture appear to flutter and vanish as you walk by it. Have you got a creepy crawly bug sculpture in your garden? Those are some big bugs! They sure are! When it comes to adding decor to a garden, “to each their own”.